The professional beach bully makes money by pretending to steal someone's girlfriend, her boyfriend punches him, he goes down, the girlfriend swoons and her boyfriend slips him 50 bucks. 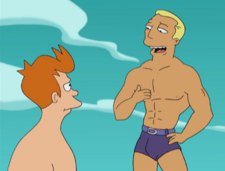 He tried this technique on Fry and Leela but to no avail as they weren't in fact boyfriend and girlfriend. However, he is actually gay. Amy somehow gets a picture of him and puts it in her locker, as seen in the game. Leela: I suppose we could go for a walk on the beach. Professional beach bully: No thanks, ma'am, I'm actually gay.